"Our guiding principle has always been to select the most conservative viable candidate. In our judgment, that candidate is Mitt Romney, the former governor of Massachusetts. Unlike some other candidates in the race, Romney is a full-spectrum conservative: a supporter of free-market economics and limited government, moral causes such as the right to life and the preservation of marriage, and a foreign policy based on the national interest. While he has not talked much about the importance of resisting ethnic balkanization — none of the major candidates has — he supports enforcing the immigration laws and opposes amnesty. Those are important steps in the right direction." "Uniting the conservative coalition is not enough to win a presidential election, but it is a prerequisite for building on that coalition. Rudolph Giuliani did extraordinary work as mayor of New York and was inspirational on 9/11. But he and Mike Huckabee would pull apart the coalition from opposite ends: Giuliani alienating the social conservatives, and Huckabee the economic (and foreign-policy) conservatives. A Republican party that abandoned either limited government or moral standards would be much diminished in the service it could give the country." "Romney is an intelligent, articulate, and accomplished former businessman and governor. At a time when voters yearn for competence and have soured on Washington because too often the Bush administration has not demonstrated it, Romney offers proven executive skill. He has demonstrated it in everything he has done in his professional life, and his tightly organized, disciplined campaign is no exception. He himself has shown impressive focus and energy." "For some people, Romney’s Mormonism is still a barrier. But we are not electing a pastor. The notion that he will somehow be controlled by Salt Lake City or engaged in evangelism for his church is outlandish. He deserves to be judged on his considerable merits as a potential president. As he argued in his College Station speech, his faith informs his values, which he has demonstrated in both the private and public sectors. In none of these cases have any specific doctrines of his church affected the quality of his leadership. 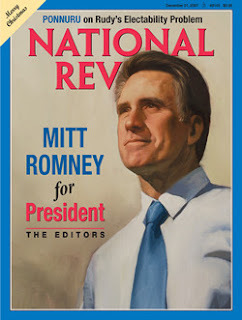 Romney is an exemplary family man and a patriot whose character matches the high office to which he aspires. More than the other primary candidates, Romney has President Bush’s virtues and avoids his flaws. His moral positions, and his instincts on taxes and foreign policy, are the same. But he is less inclined to federal activism, less tolerant of overspending, better able to defend conservative positions in debate, and more likely to demand performance from his subordinates. A winning combination, by our lights. In this most fluid and unpredictable Republican field, we vote for Mitt Romney."